Welcome to the home of Mascot software, the benchmark for identification, characterisation and quantitation of proteins using mass spectrometry data. Here, you can learn more about the tools developed by Matrix Science to get the best out of your data, whatever your chosen instrument. Mascot Server is live on this website for both Peptide Mass Fingerprint and MS/MS database searches. A selection of popular sequence databases are online, including SwissProt, NCBInr, and the EST divisions of EMBL. This free service is ideal for evaluation and searching smaller data sets. 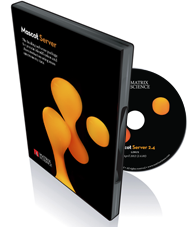 For large scale and routine work, you'll want to license Mascot Server to run in-house. Mascot Daemon is a batch automation utility, bundled with Mascot Server. In combination with Mascot Distiller, every step of a quantitation experiment can be fully automated. Subscribe to the new Mascot Newsletter, sent by email each month. Mascot Distiller offers a single, intuitive interface to native (binary) data files from Agilent, AB Sciex, Bruker, Shimadzu, Thermo and Waters. Raw data can be processed into high quality, de-isotoped peak lists. Optional toolboxes support Mascot search result review, de novo sequencing, batch processing and quantitation. If not registered, Mascot Distiller can still be used as a free project viewer, ideal for distributing search and quantitation results to colleagues. Mascot Parser provides an API (Application Programmer Interface) to Mascot Server result files, making it easy to access search results from programs written in C++, Java, Python or Perl. Free for non-commercial use.